In music, we strive to find the personality of a composer through his or her music. In classical music, we have the advantage of performing great works for years, even centuries, trying to decipher layers of meaning. When we allow ourselves to search, we eventually realize that composers are no different from the rest of us. Even coming from a different culture, century and country, we all come from the same basic place when it comes to life, struggles, and attempts to identify meaning within our world. When it comes right down to it, the composer either is trying to tell us something or inviting us into his inner world. 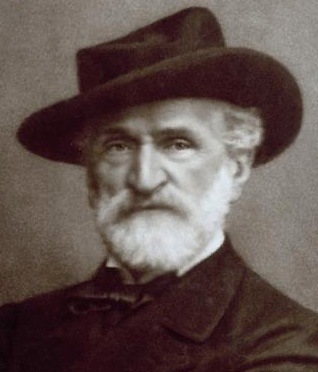 This coming Saturday, I have the honor of conducting a collaborative concert with the Salt Lake Symphony and the Utah Voices that will explore the two sides of Italy’s most famous composer, Giuseppe Verdi. The concert is a tale of two halves. Utah Voices maestro, Michael Huff, will conduct the first half of the program, consisting of Verdi’s Four Sacred Pieces (Quattro Pezzi Sacri). These pieces were written separately, but are frequently performed as a set. This is Verdi the Agnostic, utilizing religious texts and themes to explore and express inner meaning. He makes no attempts to hide that there are secrets, even unanswered questions. Small wonder he chose the so-called “enigmatic scale” for his setting of the Ave Maria. That he was trying to say something with these pieces is evident. But was he trying to express something to the audience, or work out some inner conundrum? Like a philosophical Tootsie Pop, “The World May Never Know.” But he invites us to go deeper with this powerful yet reflective music. His desire to be buried with the score of the Te Deum certainly piques my interest even more! The second half of the program is devoted to a wide selection operatic music, Verdi’s most public legacy. We will open with the Anvil Chorus from Il Trovatore. This energetic piece contains gypsy music and yes, anvils! (Well, what we are actually using is a stage secret until the performance!). In La Forza del Destino, the overture and the famous aria, Pace, pace (sung by Melissa Heath), Verdi looks inward and then expresses strongly the search for the meaning of life (literally “the force of destiny”). If that reminds us of Beethoven, there is good reason. Beethoven is his role model in many ways, musically and inspirationally. The gorgeous and moving Va, Pensiero from Nabucco is a piece that still is considered a national song of Italian pride and patriotism in Italy. It is actually a paraphrase from Psalm 137, referring to the Jews in Babylonian exile. The Italians deeply identified with this separation and longing when the piece was composed, which coincided with the Italian unification and establishment of Italy as one nation. The music is so moving that even today, Italians rally to the cause with this music. Here’s a great example from 2009, an amazing encore in Rome when the government had announced deep cuts to arts funding. We close with the most extroverted chorus of all, the final scene from Act II of Aida. It’s got it all: a song of praise, a march, a dance scene and a joyous chorus. We will be praising the gods, kings, soldiers, etc. Sorry, elephants don’t fit through the stage door. Available by calling 801-792-1313 or at the door with cash, check or credit card.